Holly House publisher Dean Summers is a Christian Minister ordained in 1977. He has served in churches associated with the North American Christian Convention (NACC). Dean established Holly House Publications in 1995 as the print-media extension of his ministry of equipping Christian disciples for Christian service. 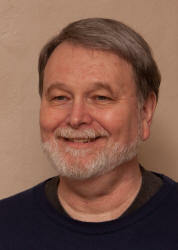 He is a consultant for Christian discipleship and Christian leadership development. Dean brings to his ministry gifts of insight, synthesis, and plain talk. He draws from a wealth of life experience that includes work as a railroad fireman, print shop manager, and pastor of an urban Christian kibbutz. He is a passionate student of the Bible. His books will engage your interest and imagination. In his college days, Dean traveled around the globe—to Tokyo and Taipei and Hong Kong—to Manila and Bangkok and Calcutta—to Tehran and to Jerusalem. From 1985 to 2018 (except for a year in South Africa), Dean and his wife Jan lived in an old house in Seattle's version of the Inner City, where they raised their family. Jan and Dean continue to live in the Pacific Northwest, not too far from their Seattle homestead. Dean loves the cultural mix of Seattle. He also loves the outdoors, where he knows how to stay dry in the rain, and where he is an accomplished camp cook and haiku poet.